Learning to ride a bike is a huge landmark in any child’s life. 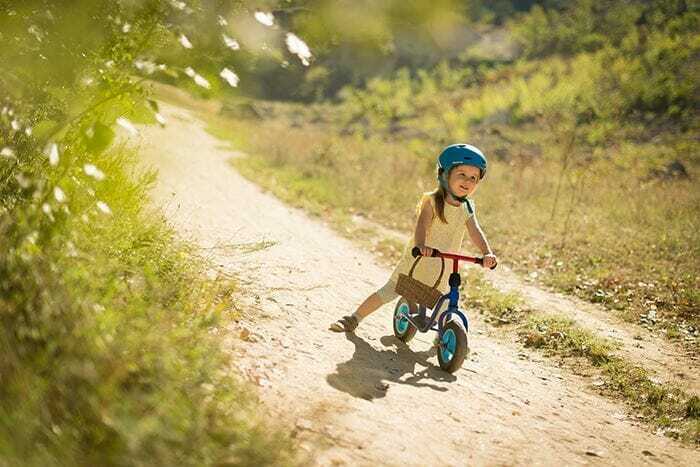 That moment when they move from training wheels to two wheels remains engrained in their memory forever and is pretty monumental for parents as well. Here are some tips and guidance on how to help your child ditch those tricycles for a two-wheeler. How Old Should Children be to Learn to Cycle? The best age to teach a child to learn how to ride a bicycle is approximately age four to six. Depending on how coordinated they are, your child can probably learn how to cycle in 30 to 45 minutes. Don’t force it or the child will become stressed thus making the experience a negative one. Since children learn best by copying what others do, have someone ride a bike while they watch, so they can see what happens. Make sure the bike that you choose isn’t too large for the child to ride. He or she should feel in control and comfortable when riding it. If it’s too large, then it will take them longer to learn how to ride, making the process frustrating and stressful for both of you. The right size wheels should be around 14 to 16 inches. It’s important that the balls of their feet reach the ground when they sit on the seat. Your child’s legs should be straight. So, setting the saddle in the right place is essential. If it’s too low, it will make pedaling the bike difficult because their knees will ride too high. Their knees will also interfere with the bike’s steering. Picking a properly fitting helmet for your little boy or girl is very important. It should sit no more than one inch above their eyebrows and level across the center of the forehead. If the helmet moves over an inch when you manipulate the helmet from front to back or side to side, you either need a different size, or it should be adjusted. Here is a good article that explains how to pick the right helmet for your child. For your child’s first lesson, you may feel like soft grass is the best place to teach them how to ride a bike. It’s logical that you would pick soft grass in case they fall off the bike, which is inevitable. You must choose a hard surface for them to cycle on. A relatively flat and smooth surface is best so that they can gain momentum when rolling. Naturally, it should be located where there is no traffic. Try to avoid hills that could cause your child to pick up too much speed when they aren’t prepared for it yet. Some people suggest that it’s a really good idea to start your child learning to ride without pedals. This allows your son or daughter to propel themselves along and learn how to turn the bike and balance. It also helps them gain confidence. If you are extending the process out of a longer timeframe, training wheels are a useful tool for a few weeks but don’t let your child get too comfortable using them. They may develop bad habits that you will need to break when you take them off. When they are ready to ride on two wheels, start them off by having them push the pedals backward. Also, let them put their feet down while you hold the bike upright for them so they can get a feel for it. Now, rest your hand on the back of their neck or on the bike seat to keep them steady. Have your child start pedaling looking straight ahead, not at the ground. This will help he or she steer straight. Run alongside them until they are moving at a reasonable speed and balanced. Let go! Console and encourage them if they stumble or fall off so that they aren’t afraid to jump back on the bike and try once more. Teach them how to get ready with one pedal up and moved slightly forward. Have them push down hard on the pedal to put the bike in motion without your help. They’ll need to practice building up their speed so that they remain balanced and upright on the bike. Learning how to ride a bike should be a fun activity and build confidence in your child. Some children will learn how to ride a bike in one afternoon while others may take a week or more. It’s a good idea to end the training when it stops being fun and try again later. You can also sign your child up for professional lessons.